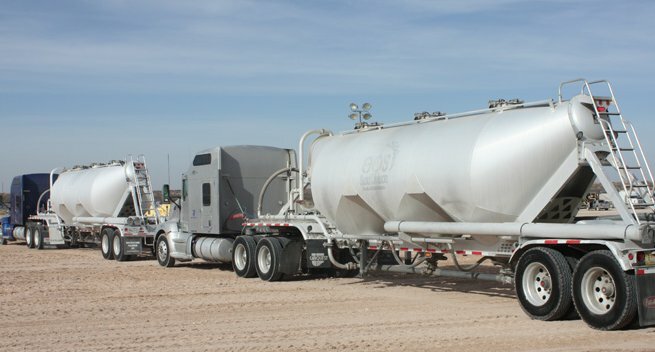 The Kermit, Texas plant of Hi-Crush Partners LP, located in the Permian Basin, has an annual production capacity of 3m tons of high-quality West Texas frac sand sourced from Quaternary aeolian sand dunes. Hi-Crush sold a total of 8.9m. tons frac sand in 2017, more than double 2016 volumes. Courtesy Hi-Crush Partners. Since the mid-2000s, three of the most important ceramic raw materials – silica, kaolin, and bauxite – have been in high demand from the North American oil and gas drilling industry as proppants in its pursuit of developing unconventional resources, in particular, shale gas and shale oil. After a recent dip in demand, we are right now witnessing another “Mother of a Sandstorm” of proppant demand. This time it’s slightly different in that silica is totally dominant, but there is the same question of whether there will be enough material for its other markets, eg. ceramics, glass, foundry. And what of the future of ceramic proppants? In simple terms, the extraction process of hydraulic fracturing (fracking) requires vast amounts of water entrained with additives including spherical grains of ceramic material to be pumped under high pressure into shale formations to recover oil and gas finely disseminated in the rock’s pores. Fissures and fractures are opened up perpendicular to the main well bore in which reside the spherical grains to simply prop open the fractures (thus “proppants”) to maintain a flow of oil or gas (conductivity) into the main well bore for pumping to the surface. Although this treatment for well stimulation has been around since 1949, it was only perfected in the late 1980s, and really came to the fore in the early- to mid-2000s combined with advances in horizontal drilling techniques and a drive for cheaper gas from flat lying shale gas formations. At the same time, proppant science evolved to meet demands for high crush resistance under pressure, and above all induce high conductivity in application. Seemingly almost overnight, the humble silica sand was in high intensity demand as US and Canadian Exploration and Production (E&P) companies started fracking in earnest. To gain some perspective, according to US Geological Survey data, in 2005, just 8% or 2.3m tonnes of US silica sand produced was used as frac sand. In 2017, this share had risen to 63%, or 66m tonnes! But silica sand is not the only proppant game in town: deeper and higher temperature wells require higher strength grades which can only be manufactured mostly from sintering bauxite or kaolin or blends of each. More recently, ultra high strength grades have been introduced based on high alumina materials. The resin coating of silica sand also introduced a third option in proppant selection, enhancing silica sand performance, but still short of the superior performance, but 4-6x more expensive, ceramic proppant grades. The upshot was an explosion of US frac sand mine developments (then, mainly in Wisconsin, Missouri, Illinois – so-called Northern White sands), diversion of existing silica sand production to frac sand, and a lesser degree but nonetheless significant investment in more sophisticated ceramic proppant plants. Chinese refractory and abrasive bauxite producers in particular lost no time in diversifying into supplying the US proppant market, and enjoyed high volume penetration until around 2012 when US plants started to catch up and the market was on the wane, albeit with a slight recovery in 2014. The prevailing proppant share split for many years read something like 70-80% frac sand, with the remainder a mix of resin coated and ceramic proppants. From 2014 overall proppant demand started to slacken, and was compounded by the oil price fall in 2015. At the same time, there started a trend, which has since become a stampede, to fracture using huge volumes of cheap silica sand and steadily eroding ceramic proppant’s share of the market. During 2015 this caught hold to the extent that most ceramic proppant producers either closed or mothballed most of their plants, eg. the likes of Carbo Ceramics, Saint-Gobain, and unfortunate latecomers to the proppant party, Imerys, affecting about 80% of US capacity. There has been little if any recovery of late, as silica sand is king. From mid-2017 proppant demand for silica sand started to pick up markedly and is now hitting stellar heights, with US market demand for 2018 expected to increase by 45% to 100m-110m tonnes – and this is a conservative estimate, apparently the market “has yet to peak” according to one consultant. The proppant share split is now around 94% silica sand, 5% resin coated, and the remainder ceramic. Recently announced 2017 results saw Hi-Crush Partners LP sell 8.9m. tons of frac sand, more than double 2016 volumes, while US Silica sold a record 3.2m tons in Q4 2017, 52% up over Q4 2016. The recovering oil price into the US$60s/bbl has helped, but the main driver has been the longer lateral lengths drilled by E&Ps and the rising intensity of proppant loading levels per frac stage, eg. 2,000 lbs proppant per lateral foot in the Delaware Basin, up 32% from 2016 levels; 140,000 lbs per stage in the Bakken; in the Permian Basin wells are consuming 5,000 tons per well, and elsewhere 6-7,000 tons per well is reported. A second key trend, is the shift to using mostly the finer 100 mesh, but also 40/70 mesh sizes. This raises the interesting issue of how this may affect the balance of industrial sand supply. Sure, frac sand only producers have tunnel vision, but what of all-rounders such as the likes of US Silica and Unimin which need to maintain supply to their industrial or speciality markets in glass and ceramics. Industrial sands can be “converted” to frac sand, but not always the reverse. The continued push for finer frac sands could impact certain industrial markets such as fibre glass. That said, what is often specified as “100 mesh” for one proppant customer does not always match that of another, and currently there is much mixing of grades (but it still works!). 40/70 and 100 mesh is used in glass as well, but here’s the thing: with spot prices going north of $60/t (expecting to reach $75/t in the Permian this year; Northern White sand already >$100/t) for frac sand, which requires minimal processing and QC, compared to <$30/t for a glass sand grade requiring strict chemical and physical specifications and treatment, it’s little wonder that producers (especially those that are publicly traded) are leaning to the proppant markets. Sure, 2-3 year frac contract prices are lower priced, at around $30-40/t, but remain lucrative deals – US Silica announced it had over 30 long term contracts, and is aiming for 70-80% contracted output. 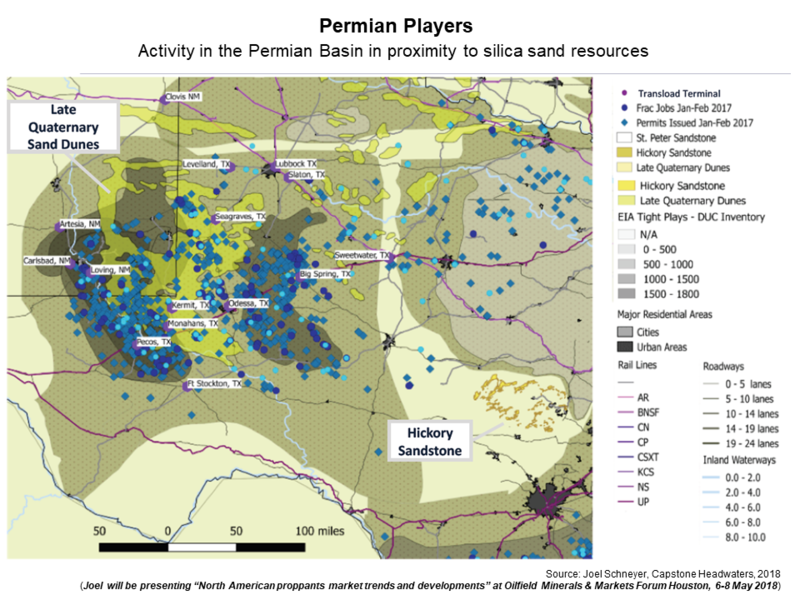 The third main trend making waves is the rush to develop in-basin sand sources in the Permian, using cheaper and what was initially considered inferior brown coloured sand in Texas. Of course, with the increase in Permian fracturing activity combined with the high logistical cost factor of moving sand (can account for up to 70% of delivered price) the southern brown sand is suddenly in vogue and end users are desperate for it as supply is tight at present. Hence the latest sandstorm in the Permian with a raft of companies bringing on new mines and plants, eg. US Silica alone is bringing on 6.6m tonnes of new capacity there. 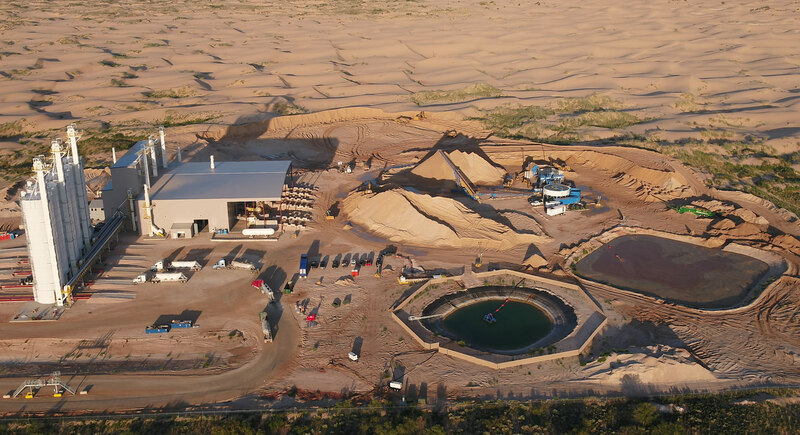 The good news is that as more Permian sand becomes available towards the year end – and estimates are put at 25-30m tpa in total – then this will ease the tight supply situation for other industrial and speciality consumers of the northern sands. Thanks Mike. Do you see the frenzy extending outside the USA eg Canada, Europe, Australia, Asia? Many thanks Richard. This particular phase of silica sand demand intensity is specific to the US market. However, there are signs that proppant demand is set to increase in the Middle East – especially in Saudi Arabia, Oman, and Egypt. Of significance for the ceramic proppant sector (outside the US) is the drastic reduction in Chinese domestic production capacity, which will struggle to meet rising domestic demand let alone feed export markets – thus opening door for ex-China ceramic proppant sources prospects. Hi Mike, Thanks again. Extrapolating your numbers I calculate current US demand for ceramic proppants at 0.7 M tonnes compared to about 2.5 M tonnes in 2014. Do you think the market for ceramic proppants in the USA will recover ? “Not anytime soon” would be a quick and familiar response to that question. Even given the demand for deep drilling offshore in the GoM, and some CP used in the Bakken, I don’t think it’s likely to rebound to the levels of a few years ago. Check out Carbo Ceramics’ sales figures and their pursuit of diversification (grinding media, foundry sand) – this says a lot.